Police have closed several major streets in Toronto after huge slabs of ice were reported falling off skyscrapers in the Canadian city. "Current weather conditions are presenting safety concerns," police said in a statement. The roads that were closed included parts of the Gardiner Expressway, the main road into the city centre. The city was recently hit by a snow storm. Plunging temperatures then turned melting snow into ice. Police said the closures would remain in effect "as long as there is a danger to public safety". Part of the financial district was closed to traffic, included an area of King Street, home to the Toronto Stock Exchange. 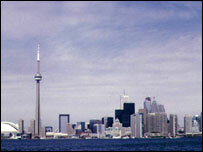 Several pieces of ice were torn loose from the 553-metre (1,815ft) CN Tower, the Globe and Mail newspaper reported. One huge slab - "four feet by four feet [1x1m]" - flew over the Gardiner, a policeman told the newspaper. Do you have any photos or video of these ice slabs? You can send pictures and video to: yourpics@bbc.co.uk or to send via MMS please dial +44 7725 100 100. Do not endanger yourself or others when taking photos. Do not take any unnecessary risks or infringe any laws.